Countdown to TradeCentre: Interest picking up on Johansson? The National Hockey League's Trade Deadline is 3 p.m. ET on Monday, Feb. 25, and teams will be making decisions on whether to buy or sell and decide which players can make the biggest difference and hold the greatest value. Check out the latest trade rumours and speculation from around the NHL beat. 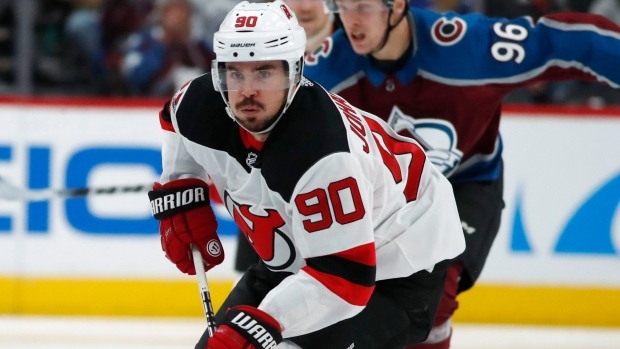 Interest has picked up the last few days on New Jersey Devils forward Marcus Johansson according to TSN Hockey Insider Pierre LeBrun. LeBrun adds that he has a five-team no-trade list but it's believed none of those teams are in play for him anyway. General manager Ray Shero proved last week that he is willing to make deals before deadline day, trading forward Brian Boyle to the Nashville Predators in exchange for a second-round draft pick. Johansson is healthy and playing well, recording 10 points in his last 11 games and 20 in his last 28 contests for New Jersey. For the season, he has 11 goals and 14 assists in 46 games. He was placed on injured reserve earlier this season with an upper-body injury. He currently occupies the No. 16 spot on TSN's Trade Bait Board. Jets pushing hard for Stone? It looks like the Winnipeg Jets are ramping up their pursuit of Ottawa Senators forward Mark Stone. “The belief here is the Jets want a deal for Stone done as soon as possible and those talks have intensified lately to try to make it a reality,” writes Postmedia’s Bruce Garrioch. With the Senators in Winnipeg Saturday night, general managers Pierre Dorion and Kevin Cheveldayoff could have a chance to ramp up talks. According to Garrioch, the two GMs spoke Friday afternoon at Bell MTS Place. Garroich adds that league executives say Cheveldayoff is a huge fan of Stone because of his status as one of the best two-way players in the league and ability to provide depth for the Jets up front. The Vegas Golden Knights are also showing “heavy interest” in the 26-year-old winger and if they make a deal they’d likely be interested in getting an extension done. Several other teams around the league are reportedly interested in acquiring him. Despite the growing interest in Stone, the Senators would still like to sign him to an extension. The same rings true for forwards Matt Duchene and Ryan Dzingel, who are also slated to become free agents as of July 1. Garrioch reports that if Winnipeg doesn’t acquire Stone, they could turn their focus to Duchene or Dzingel to bolster their offensive attack. Stone currently occupies the No. 3 spot on TSN’s Trade Bait Board, with Duchene coming in at No. 2 and Dzingel at No. 18. The Dallas Stars are willing to add a player on an expiring contract – preferably a scorer – if the cost is right, general manager Jim Nill told Mark Zeisberger of NHL.com. Nill also spoke of his desire to add to his team’s scoring. The Stars rank third-last in the league with 145 goals-for but occupy the first Western Conference wild card spot by three points entering play Saturday. Despite the willingness to add scoring, Nill thinks the team he has is poised to make a run regardless if a move is made or not. “I know that once we make the playoffs, we’re going to be a tough, tough team to play against. We’ve been in the top three or five in goals-against all year. Our defence has become a strength. What excites me is we have a lot of guys who have played well but haven’t gotten the point totals you might expect. We know what their ceiling is. I just think we’ve finally found our identity,” Nill said. Oilers to wait and see on Stolarz? The Edmonton Oilers are seven points out of a playoff spot coming into play Saturday. While the team is still chasing the postseason the focus will be on winning games and not worrying about newly-acquired goaltender Anthony Stolarz and his contract status according to TSN’s Ryan Rishaug. Stolarz, who can possibly become a restricted free agent this off-season rather than an unrestricted one, was acquired from the Philadelphia Flyers by Edmonton Friday night in exchange for veteran netminder Cam Talbot. If the Oilers play Stolarz for 30 minutes or more in 10 of their final 25 games, then they will avoid the 25-year-old becoming a Group VI UFA this summer. “If they fall too far, I could see them try and hit the 10 game target, but I don’t believe it’s a focus in their decisions right now,” Rishaug tweeted Saturday. Stolarz, 25, has a goals-against-average of 3.33 and a save percentage of .902 over 12 appearances this season.